Rounding the corner of East Bay and George, you may have been intrigued by a place called Maison du Pré. It is not one, but several houses whose ancient walls come right to the sidewalk. The only entry is a pair of tall wrought iron gates that offer glimpses of the courtyard within. â€¨â€¨The gates are just the beginning. On entering the compound, wandering from house to house, many questions come to mind. Who built these Charleston single houses, plus the kitchen and carriage houses? How old are they? 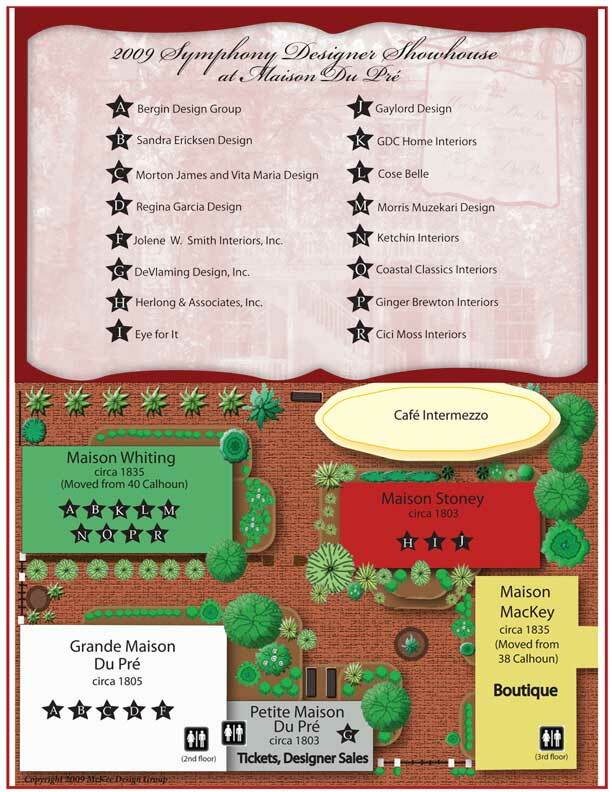 Were they always located on this plot of land, or were they moved from somewhere else?â€¨ â€¨Once Maison du Pré was selected as the CSOL’s 2009 Symphony Designer Showhouse, Carol Lou Yaeger and her committee delved a little deeper. When they heard the main house contained a “mortgage button,” they searched until they found it. Eyeing the kitchen house, they wondered how people got to the second floor before the main house was built. And then there’s the carriage house. It has a bricked-up doorway to the right of the present door and another in a powder room on the second floor. Why? Recently, an artist doing some work in the carriage house was certain he saw a ghost. Could it be, or was he simply caught up in the romantic atmosphere of this place? During the past 20 years, while the property operated as a bed and breakfast, the owners kept albums to preserve memories of the recent past. Smiling faces look out from dozens of wedding and party pictures. Some are celebrities, famous actors and musicians who partied or stayed at Maison du Pré. One is of a famous cellist whose name will ring a bell. Another was a dashing leading man. Also, several of our CSOL members have attended parties or stayed at Maison du Pré and one of our favorite flautists has played in the music room. â€¨â€¨Here is another story you may enjoy. One night, a young lady in the bridal suite was luxuriating in the claw foot tub while her beau perched on the side to take a picture. Unfortunately, the foot broke causing all that bubble bath to cascade down to the floor below. Did we mention this happened to be the lobby and it was the bed and breakfast’s opening night? 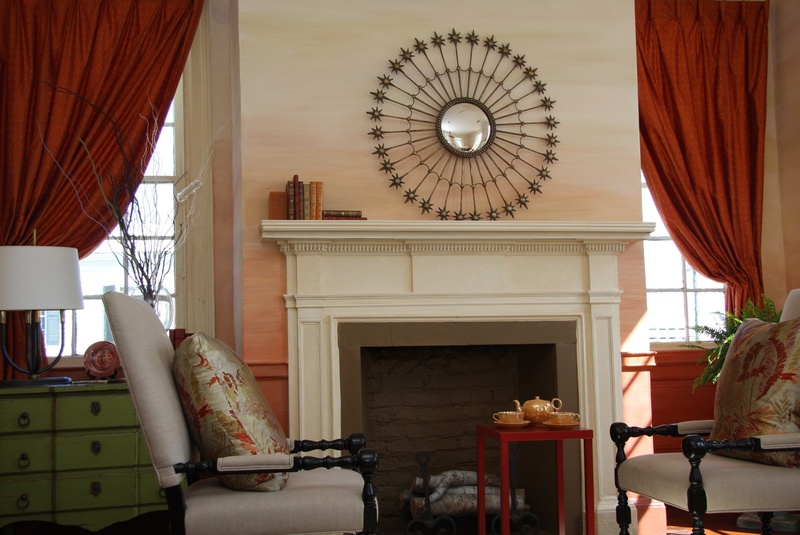 â€¨â€¨Now that the 2009 Symphony Designer Showhouse has opened its doors, you may come to see how our talented designers have transformed its rooms and enjoy the many stories and mysteries a place like this contains. We have researched the 250 year history of the property, so to be fully prepared for your visit, click here to read it. The home is open daily through Sunday, April 19, except for the Easter holiday. Hours are 10:00 am. to 4:00 pm., Monday through Saturday, and 1:00 to 4:00 pm. on Sunday. We are pleased to announce that Tidelands Bank is the official bank of the CSOL® and is a major sponsor of the 2009 Symphony Designer Showhouse. Thank you, Tidelands Bank! Our official program sponsor for the Showhouse is Charleston Home Magazine. 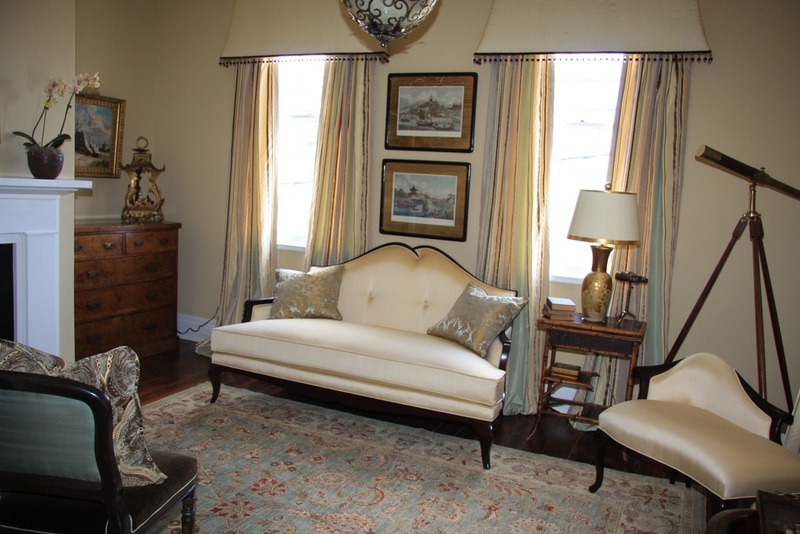 The 2009 Symphony Designer Showhouse in Charleston is quite like Charleston itself-inviting, well designed, a seamless integration of timelessness and forward thinking, of rich history and diverse personality. The Show House is actually five historic homes surrounding a garden courtyard filled with mature trees, enchanting flowerbeds, French ambience and Southern hospitality. And inside of these architecturally significant dwellings are environments that showcase the deep talents and artistic inspirations, new concepts and lifestyle solutions of the area’s design community. 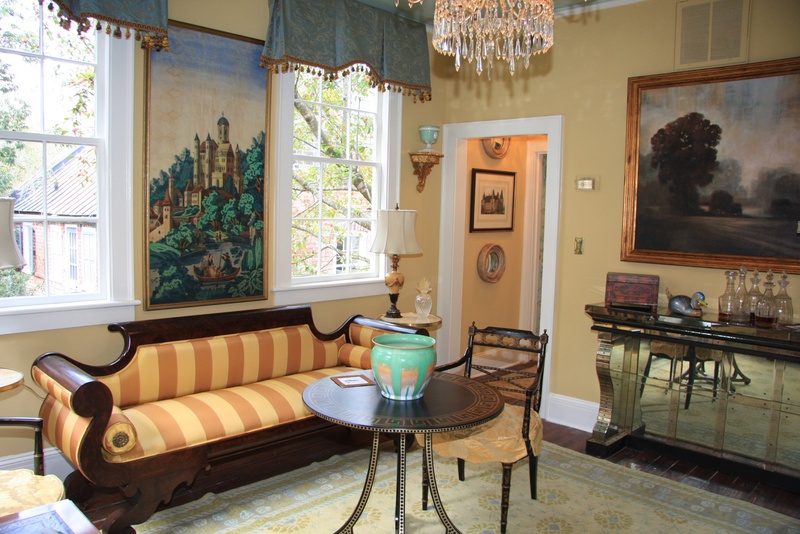 The Show House property, formerly the Maison Du Pré Inn, is located at 317 East Bay and was a B&B that was open from 1987-2007 until it was offered for the Symphony Orchestra League’s 32nd annual Designer Showhouse. The immense efforts of the owners, the Showhouse chair, hundreds of volunteers and designers have created an extraordinary vacation-like experience --a tour through history and design in a museum-like setting. The theme of the Show House is a step back in time, preserving the 1800s charm while enhancing it with 21st century luxury and comforts. 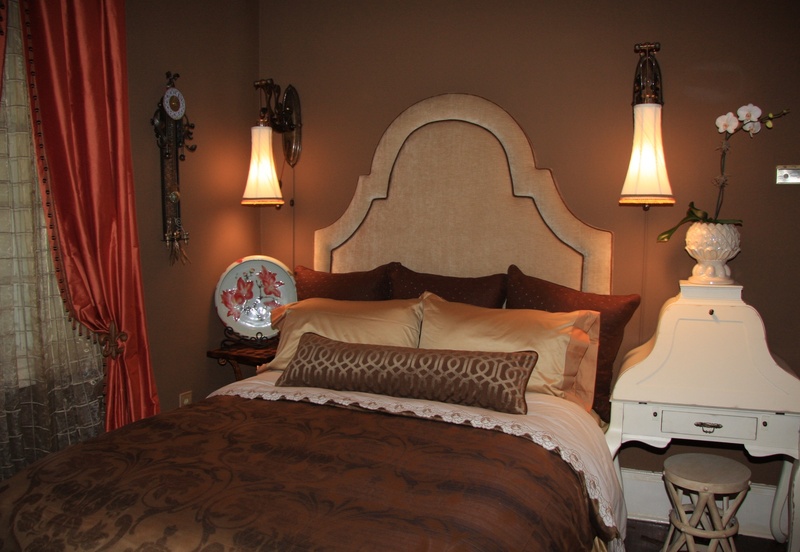 The mythical client of the designers is the Innkeeper of a working B&B so there is a great variety of vignettes and settings. And, all rooms flow together as a whole with no space demanding one’s notice or competing against another. For example, there is a formal Executive Guest Suite, a romantic Honeymoon Suite, a proper Club Room, and restful Afternoon Sitting Area, several airy piazzas, and glorious guest rooms. I am sure that everyone who visits this Show House will want to book a stay in this special place. The Tour starts in the Grand Maison Du Pré, the main estate on the property that dates back to 1805. In traditional Charleston architectural style, the “single house” with its piazzas and multiple levels, is narrow and long. I was told that this style was adapted because residents were taxed on the amount of street space their dwelling occupied and so is placed sideways to the street to minimize the footage taxed. I learned lots of things here. I saw my very first mortgage button. The one in this house is an ivory button that is placed on the top part of the banister designating the mortgage was paid off! This house contains the socializing rooms, the Dining Room, Music Room, Morning Room and Afternoon Sitting rooms. Additionally there is a piazza and Executive Guest Suite. These rooms were well designed for their function and purpose. The Afternoon Sitting Room is awash in a paint technique that looks just like a spectacular sunset. 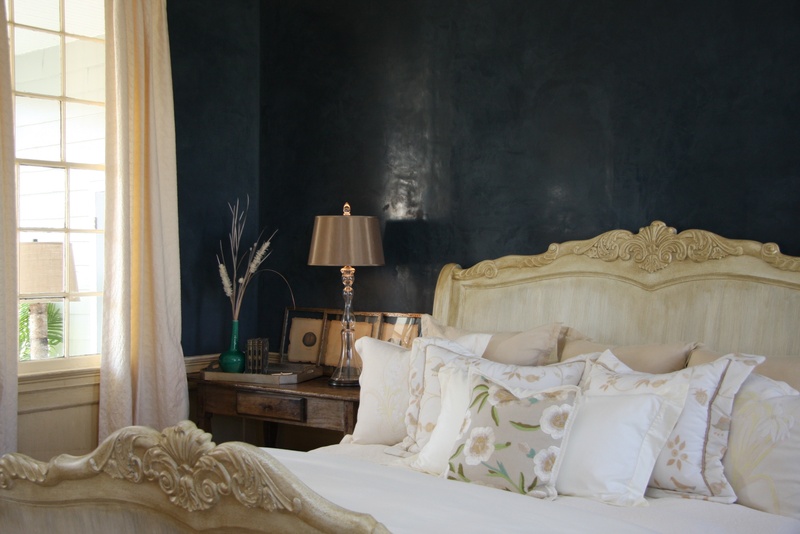 The Executive Guest Suite is a masculine venetian blue plaster with a clean, crisp comfortable feeling. The Music Room is formal with a quiet luxury. The purposeful selection of all green products in the Guest Room in Maison Stoney by Sandra Gaylord is proof that green can be stylish. This show-stopper of a room is tiny but so incredibly livable. 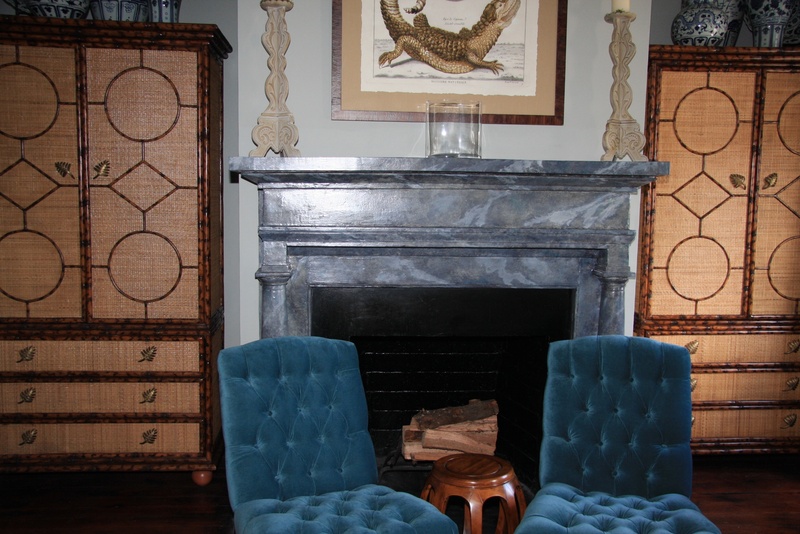 The Gathering Room by designers Angie Artigues and Terri Baldwin is a study in form and function. The built in desk is a simple, serene addition that I would never have thought of but am certain will be copied in many studies from now on. Herlong & Associates prove that opposites attract. Their play with the lavender and orange is cheerful, sophisticated and edgy. The bathroom has one of the best solutions for handing sink pipes I have ever seen. 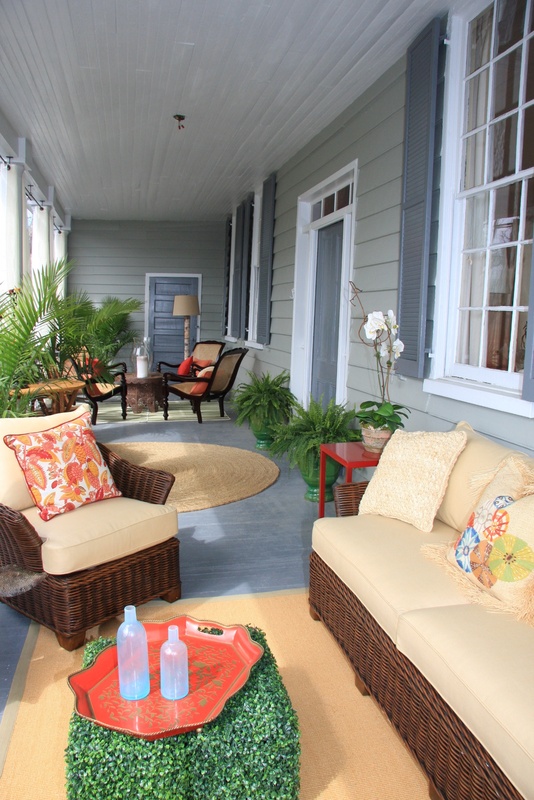 The Show House boutique is located in Maison Mackay, a 3 story Charleston Single. This is a multi-level shopping experience with a great variety of treasures. Where else can you go these days and shop, dine, meet designers, walk through a private historic property, see art, and experience the highest standards of design all in one place and one day? The moment you enter this Show House you are transported to a by-gone era in the warm spirit of one of the friendliest cities on Earth. Special Thanks to Carol Lou Yaeger for her hospitality, generous help in providing details, facts, and humor about this project and her true devotion to the production and success of The 2009 Symphony Designer Showhouse. To reach the 2009 Symphony Designer Showhouse in Charleston, SC, simply drive north on Bay St past So Be It Lane, onto Front Street, then turn left on Minority Street at the Maison Du Pré sign. Oh wait, I'm sorry. I'm looking at the 1801 map of Charleston. The 2009 map of Charleston gives the Showhouse address as 317 E. Bay at the corner of George Street. The Showhouse is a collection of five antebellum homes that until recently was a famous romantic bed & breakfast inn named Maison Du Pré. The Inn will re-open its gates on March 19 for visitors to “Step Back in Time” and view how 21st century comforts have been incorporated into its historic rooms. 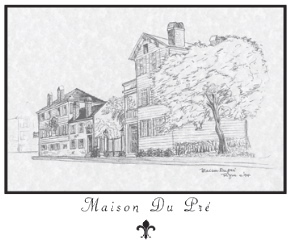 Maison Du Pré is located in the heart of a section of old Charleston known as the “Federal Green”. 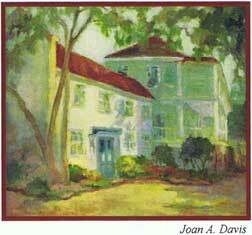 Christopher Gadsden purchased the Federal Green in 1758 before the Revolutionary War, and built his home there. A leader of the Sons of Liberty, Gadsden was a famous American patriot. He was primarily responsible for promoting Benjamin Franklin's coiled rattlesnake and “Don't Tread On Me” image on a yellow flag. This motto caught on to become the battle cry of the colonial revolutionaries. Gadsden's land consisted of 25 acres of high ground and 20 acres of marsh. The General filled in the marshes, divided the area into 6 wharf lots and 197 back lots, created a number of new streets, and named his village “Middlesex”. Pitt Street was the southern boundary, bordering the land of Colonel Henry Laurens. Pitt was soon renamed Laurens Street so it would not be confused with Pitt Street in Harleston Village. Middlesex was bounded on the north by Boundary St, originally the boundary between Gadsden's land and Alexander Mazyck, and renamed Calhoun street in 1849. The western boundary was Wall Street which is now only one-half block long due to the construction of the Gaillard Auditorium. The land extended east to the Gadsden's Wharf on the Cooper River. The street originally called Middle Street was made part of Alexander St. in 1903 and Minority Street was renamed George when George was extended through the area and connected to it. The remaining streets in the area retain their original names. Gadsden's high ground lots were viewed as a good investment at the turn of the 19th century when Charleston was between the Revolution and War of 1812 and trying to recover. Real estate speculation was prevalent and several owners were able to make a quick pound (£) by reselling the lots (a popular concept known today as “flipping”). The four lots fronting the block where Maison Du Pré sits were bought and sold several times after their initial sale in 1799 and before homes were built. By 1806, only fifteen lots out of 197 had been sold and even fewer had buildings. It was not until the boom period after 1812 when the merchants started purchasing these desirable lots. Plantation owners built houses where they could escape the mosquitoes in the summer and ship captains could keep an eye on their ships in the harbor. By 1852, only 3 lots were without buildings and the area was considered an expansion of Ansonborough. The Civil War took its toll on the area, but it still remained a desirable location. When the great depression caused a downturn and forced homeowners to take in borders, the character of the neighborhood changed, pride declined and neglect soon followed. In the 1960's, the Historic Charleston Foundation stepped in with a massive preservation project to save the Ansonborough area. This project was responsible for elevating the area to its former glory. The construction of the Gaillard Auditorium in 1966 caused other dilapidated homes to be demolished, but homes worth saving were moved and restored. Maison Du Pré was on the edge of this area as seen on the photo below. Gadsden's filled marsh land between E. Bay St. and the Cooper River became known as 'Rottenborough' and not suitable for small building lots. The area is now primarily open space and only large commercial buildings (the South Carolina Aquarium, Ft. Sumter Museum, and Maritime Center) are built on the original Gadsden's wharf on the edge of the Cooper River. The first lots sold in Gadsden's Middlesex were the group owned by Gadsden's daughter-in-law, Martha. Martha gave six lots to her niece, Mary Middleton after Mary's husband Arthur died and their fortune at their plantation was lost in the Revolutionary War. Mary sold all of the lots in August, 1799 for amounts ranging from 440 to 560 pounds(£). Lot 5 at the SW corner of Front Street and Minority Street (317 East Bay) was originally 150 feet in length from Front Street. Mary was sold it to Susanna Egan McDonald, then Susanna sold a portion of the lot (100 ft) to Benjamin Du Pré in 1803. Less than two years later Benjamin resold it to Thomas Lesesne to make a tidy profit. Lesesne resold it to William Boyd in 1807, but for a loss. Boyd had worse luck because he had over 900 Negroes when the Slave Trade embargo caused most of them to die before they could be sold, estimating his loss at $140,000. Boyd was unable to get a government bail-out, so the Bank of South Carolina sold Boyd's property at auction in 1813. It was described as including a wooden 2 story building on a brick foundation on the first 100 feet and a one-story wooden building on the rear 50 feet. John Safford was the successful bidder for $3000. When Safford finally sold the property in 1835, it was described with a three story house and other buildings. In the ensuing years, the Kerr, Curry, Seignious, Wehman, and Myers families owned the property until it was purchased in 1983 by the Mulhollands, the current owners. Thomas Ham purchased Lot 4 (315 East Bay) from Mary, then sold it the very next year to Benjamin Du Pré. Benjamin Du Pré kept 315 E. Bay until 1811 when he sold it to Peter Gaillard for $11,000. The conveyance description did not include buildings and Benjamin was living on Church Street. Peter purchased the property for his daughter, Elizabeth, and her husband John Stoney. Their 1805 wedding was a grand affair at the Gaillard plantation called “The Rocks”. The Stoney family continued to own the property even after the main house was destroyed sometime during the Civil War. The remaining dependency at the rear was finally sold in 1874 to Charles Seignious, the neighbor at 317 E. Bay, so this transaction brought the two lots together to form what is today Maison Du Pré. The small remaining building is the third home on display. Other houses currently on Maison Du Pré are not original to either Lots 4 or 5. The 3-story Charleston single house located at the rear of Lot 5 was moved from 38 Calhoun St. This house was originally home to Dr. Albert Gallatin MacKey, his wife, Sarah Pamela Hubbell MacKey and their four children. Sarah and Albert were married in 1836 and were given the property by Sarah's parents, Sears & Charlotte W. Hubbell. Albert MacKey was a physician educated at the Medical College of South Carolina earning his degree in 1832. He practiced medicine until 1844 when his passion for the occult sciences and writing took over and he devoted his life to the Masonic cause. Google him and you will discover the extent of his writings. This home is devoted entirely to the traditional Showhouse Boutique containing unique gifts, clothing, jewelry and artwork. The front portion of Lot 4 is now occupied by a two story Charleston single house moved from 40 Calhoun. This home was occupied in its early years by Edward M. Whiting and his daughter, Elizabeth. At the age of eight, Elizabeth became the owner of both a maid and the home through two ladies with the last name Warren. The records show that Anna Warren deeded the property on Calhoun to her niece, Elizabeth Melrose Whiting, for the sum of five dollars. The transfer was a “conveyance by hush” through a third party (William Bartless), meaning the transaction was never to be mentioned. Jubah Warren was a person of color who willed her property to Mr. Whiting, and specified the wages of her slaves be given to young Elizabeth for the purpose of purchasing a maid. Both Warren women obviously had great affection for Elizabeth, but it isn't known how they were related. painter Henry Bonnetheau, and gained significant recognition for her own paintings while continuing to reside in Charleston. • Mystery No. 1: Why is MDP today less than 120 feet? • Mystery No. 2: Who built the homes that are on Lot 4 today and when? • Mystery No. 3: Who built the house at the rear of Lot 5 and when? • Mystery No. 4: Who was Elizabeth Whiting's mother? tickets and more information, go to www.csolinc.org.